Burning in the soles increases in summer. According to the medical we called it as paresthysia or neuropathy. You can fix it with the help of some home remedies. It happens rarely but if it remains for long time then you should take medical advice. Burning in the soles occurs when blood flow become slow down and nerves are damaged with the age. It also occurs with old age people or who have diabetes for longer time. Ginger: Mix ginger juice, olive oil and coconut oil. Boil for little while and apply it on your feet. You can eat small piece of ginger every day to improve the blood circulation. Vitamin B3: You get relieves from sole irritation by taking vitamin B3. You can consume egg yolks, milk, peas and beans. Foot Massage: Flow of blood in the legs increases by doing massage. You neither have burning nor pain in them. Wear right type of shoes: You should never wear tight shoes. Otherwise it slows the flow of blood to the legs. Walk without shoes: Blood circulation increases by walking on the grass without shoes. Gourd: Erode the gourd or remove its pulp and apply it on your feet on summer. It heals the burning in the feet. Mustard: You can get relief in burning of hand-feet by applying mustard oil. Take 2 glass hot water mixes 1 teaspoon of mustard oil and keep your foot in it. Keep your feet for 5 minutes and scrub your feet. It removes healing from the feet. Henna: Make a paste from henna, vinegar or lemon juice. You get relief from irritation. Coriander: Grind dried coriander and sugar in equal in amounts. Take it 4 times daily in the amount of 2 tablespoons with cold water. 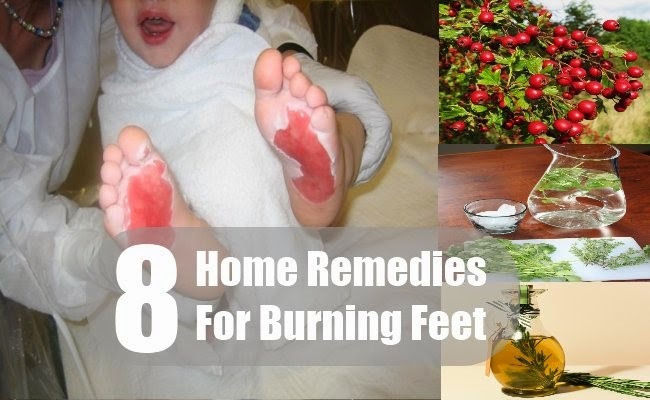 You get relief from burning in feet. Butter: Mix butter and sugar in equal amounts. Apply it on your feet and you will get relief from feet irritation and burning.